So… I have kind of been shirking my duties as a student in favor of blogging… That being said, I’m going to take the next couple of days to get all caught up with my assignments. I promise I’m not leaving! I just want to apologize for slowing down my activity. 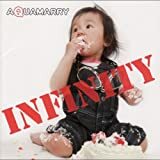 In other news, I have ordered the Aquamarry album! I’m thrilled. Its on backorder so it should be about a month or a month and a half before I actually get it. I’ll keep everybody posted on how that goes. I hope there are no problems. I seriously want this album, you guys. You have no clue how much. Well, time to do some math. Yippie, skippie. First of all, let me begin this review with some disappointing news. I will not be reviewing this entire album. Why? Because I haven’t heard half of it! This album is so rare that I can’t even find anywhere to purchase it from. Through doing some obsessive trolling on sites like Myspace and Audioleaf, I have been lucky enough to hear half of this album. Its really a shame that this band is that indie. On to the review! The album's cover. Click on it to visit Aquamarry's Myspace! Track 1: Flapjack- What a start to an album! Some hard guitar and strange, hollow-sounding beats on the drums start off the song and then back off when the jumpy vocals begin. This is what I would consider a “party song.” It’s pretty good, and accomplishes the task to giving a taste of Aquamarry’s sound. Track 2: プラスチックロボットボーイ- So, I know that I am supposed to be praising this band but this song is just awful. However, I can forgive them for it. Track 3: Mirror Ball- This is the leading track from the album, and even has its own PV! You can watch it here! It’s pretty terrible, to be honest, but you can’t forget that this is an indie band so you shouldn’t expect any bells or whistles as far as the PVs go. One time, I made a list in my head of the best songs I had ever heard. This song was number 6 on that list. Before it came “Mizerable” by Gackt at #5, “D-tecnolife” by UVERworld at #4, “Planetarium” by Ai Otsuka at #3, “Colors of the Heart” by UVERworld at #2, and the beautiful “Kingyo Hanabi” by Ai Otsuka at #1. But you can’t count out Mirrorball! It’s just perfect. I love the guitar in it, and the melody is very unique. Track 8: Water Sprite- I have come to realize that Aquamarry’s trademark is the sound of a guitar that has a significant echo, so much so that it gives the feel of being submerged underwater. Perhaps this is why they are called AQUAmarry? The “underwater guitar” is prominent in the vocals while an echo effect is added to Cinnamon’s voice. In the hook, the echo disappears and the voice gets stronger. Then in the chorus, the “underwater guitar” takes a backseat to the drums. The cycle repeats seamlessly into the second verse/hook/chorus. It’s a great piece of music with equally great transitions that don’t feel rushed, awkward, or out of place. 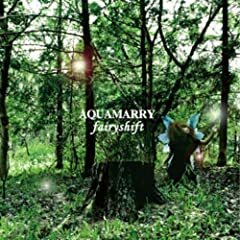 Next time, I will do Aquamarry’s second release, “Fairyshift.” Luckily I have been able to listen to all of it. Hopefully this review has done something to spread the word of a band that nobody has heard of, but should know about. Be sure to leave me comments about what you thought of this review and/or if you know anything about or have an interest in Aquamarry! Well, here I am, falling into the blogging craze that everyone seems to want to be a part of. I’m just your typical Japan addict trying to survive a community college setting. Not much more to be said there. I’m looking forward to reviewing all sorts of fascinating Japanese music. I’ll try to do all kinds of genres… even… R&B!?!?! AAAHHH! Stay tuned for my first review of XodiacK’s “Owari no Hajimari” single. My fiance and I are all about this band at the moment.